Plum Creek Alpacas is a ten-acre alpaca farm in Prescott Valley, Arizona. They pride themselves on a small but extraordinary herd of Huacaya alpacas. Intentionally keeping their herd small allows them to work with their animals by using a hands-on approach that is especially essential with their young stock. At Plum Creek Alpacas, they focus on raising and breeding an elite herd of colored Alpacas with outstanding bloodlines to produce champions with exquisite fibers. 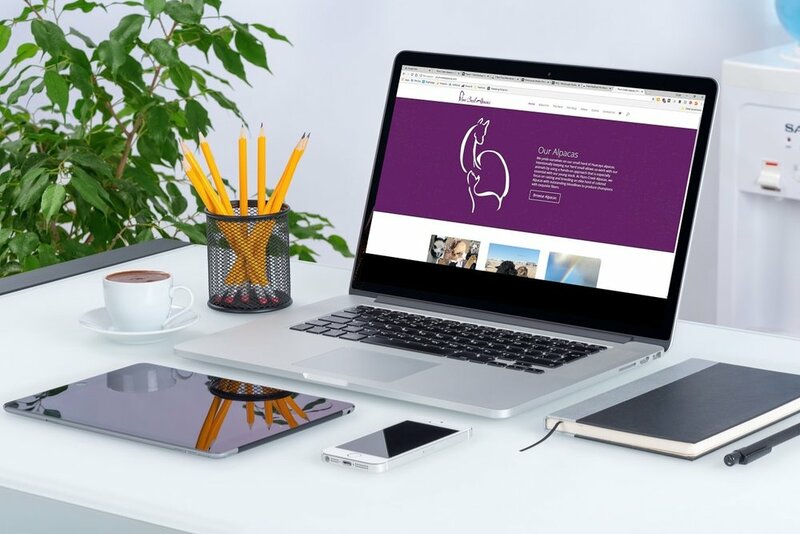 When Brian and Valerie came to us, they had already had a logo drawn for them so we took their adorable alpaca design, digitalized it, and created complementary graphics and icons that would enhance their already great logo for both web and print use. Using the graphics discussed above, we were able to create a site that reflects Brian and Valerie's vibrant personalities as well as showcase their prized alpacas, provide information about alpaca farming, and allow customers to purchase handmade alpaca crafts. In addition to designing and setting up their website, we had the chance to do onsite and offsite SEO to ensure that anyone searching for alpacas in their service area would find them easily and quickly in the Search Engine Results Pages.